I am not sure which expression of dynamic presence Jesus offers us in this story is more impressive. 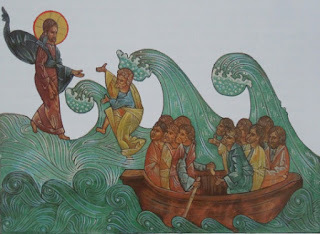 If it is the experience of Peter, stepping out into seas roiling with swells and foam, then I am focused on a Jesus who tells us that it is ok to get out of the boat. If I focus on the moment when he takes hold of the gunwale and the storm is calmed, then I am dialed in on the ideal that when we commit to God even the greatest chaos can be stilled with a touch. Either way, I am undone. Why? Because for one brief, shining moment we are given an opportunity to experience in the person of Jesus the sort of divine intervention that we would like to count on. God IS for us, and God is easily and discernibly active in the here and now. There is no doubt that Jesus is doing sometime that is beyond the bounds of normal, physical parameters. He is walking on water, and stormy waters at that. Jesus stills a storm. Anyone who has been at sea in a small boat knows just how terrifying even a small squall can be...and Jesus is able to still that tumult, just by touching the boat. I think that I want God active like that ALL THE TIME in my life. Don't you? I would like to KNOW that God is present in such a dramatic way. Yes? Life might make a little more sense, perhaps. Life might display a little more clarity. I like to think it would, anyway. But I have to be honest. There is another way to look at this reading that is a little more honest. You see, I have to acknowledge that God really is present like that, all the time in my life. I, on the other hand, am the one who like Peter takes his eye off the Lord and starts to sink in the churning waters. I, like the disciples in the boat, choose the questionable refuge of a swamping craft over the promise of safety outside the boat with our Lord. I am like every other witness to this Gospel tale and express surprise when, of course when Jesus touches our lives we find a calm in the midst of tumult that exceeds anything that we could possibly ask for, or imagine. After years and years of getting tossed by the storms of life, I am just now beginning to understand both the yearning and the confidence (however fleeting) Peter has in Jesus when he asks to be asked to get out of the boat. "God, tell me to trust you." Are we willing to admit that simple need? Today, I am. Tomorrow's storms will have to take care of itself, I think.